Welcome! Please input your email address in the box below to begin receiving periodic email newsletters from Global Wealth Advisors LLC. 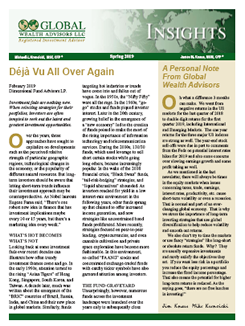 Our e-newsletter covers timely financial news and planning strategies you can put to use. You will be able to unsubscribe at any time, and this service is free. Please let us know if you enjoy receiving the email updates and if there are any topics you'd like us to cover.